Looking for a hardy perennial with an abundance of flowers that adapts to a wide range of soil and light conditions, and survives in the garden for years with little or no care? Then look to add daylilies to your garden, considered by many to be the perfect perennial. Today’s daylilies have come a long way from the yellow or orange varieties often seen along roadsides. Daylilies are not true lilies; instead they belong to the genus Hemerocallis—hemera meaning day and kallos meaning beauty—an appropriate name since each flower lasts just one day. The new breed of daylilies now come in many shapes and sizes and some even bloom more than one day, or even at night. 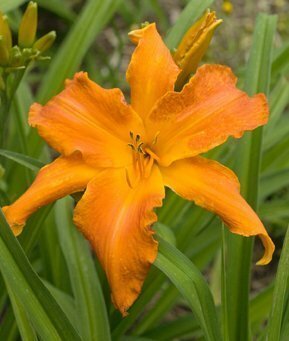 One of the newer, sought-after daylilies on the market is ‘Primal Scream’ with spectacular 7 to 8 inch tangerine orange/gold ruffled edge flowers (waltergardens.com). Another is the Enjoy 24/7 daylily that blooms continuously throughout three seasons and comes in a rainbow of colors like pink, gold, crimson, yellow and coral (gardendebut.com). And the Doublicious Daylily has repeat double blooms available in unique flower colors. A word of warning, daylilies are a favorite of deer so you will need to treat these with appropriate repellents or place them in a protected spot in your garden.